If I ever kill anyone, it will probably be while shopping. There are so many things about shopping that drive me crazy, I could write a manifesto. Just recently, I had to go pick up some medication at the Walmart pharmacy. I was already wary of the experience, having stewed in the pharmacy line before until the lid blew off my pressure cooker. 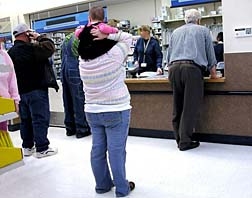 I’d learned to avoid the pharmacy nightmare on weekends, or late in the day, when the line gets long. The best time to go, I’d figured out, was on a weekday in the morning or early afternoon, when the line was usually short. I’d also tried to grease the channels by calling in my prescription the day before. 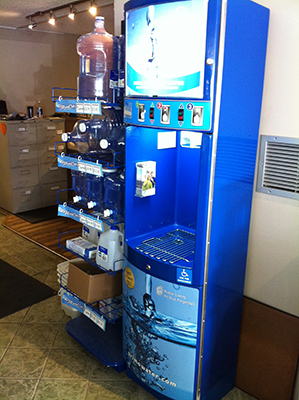 With these precautions, the waters of pharmacopoeia should be smooth sailing. Or so I thought. On this particular morning, when I arrived at the drug dispensary, there was only one person in line in front of me, an older man. I didn’t see how it could take very long with only one person ahead of me. Boy, was I wrong. But because it was a slack time, Walmart only had one person waiting on customers, though I counted at least a dozen people at work in the pharmacy that day. The one and only checkout person quickly dealt with a women at the counter and then signaled to the old man in front of me. The old man stepped forward to be helped. I moved to the front on the line, anticipating I would soon be out of there. But there was some kind of problem with the old man’s order. He kept talking to the clerk and the clerk kept trying to solve the problem, whatever it was. Have you ever noticed how time slows down when you’re in line somewhere? I think that’s what Einstein meant when he said time is relative. For example, if you’re watching a good movie, ten minutes can go by and you won’t even notice that any time passed at all. But if you’re standing in line waiting somewhere, ten minutes feels like an hour. I stood there bemoaning my bad luck to myself. Behind me the line was building, bad vibes bouncing off my back. The clerk kept struggling. All the other people working in the pharmacy seemed blissfully ignorant to what was going on. But finally, just as I was about to brain hemorrhage, another clerk showed up and opened a second register. Thank you, Jesus. I stepped up to claim my drugs. As always, the clerk demanded my date of birth. To me this is clearly an invasion of privacy. Never mind, you can’t fight the system. I gave it to him and he went off to look for my order. He came back after a while and said he couldn’t find it. I pointed out to him that I had called it in the day before to the automated system and had been assured by a computer generated voice that it was ready to pick up. Let me go look on the computer, he said and left again. Meanwhile, the old man was still occupying the only other register that was open. Maybe he was part of the occupy movement or something. After a while, my guy came back. But as he was walking by the other register, the other clerk grabbed him and sought his help with the old man’s problem. Now the old man was monopolizing both clerks. I felt totally abandoned. If I’d had a gun with me, that would have been when I’d have lost control and started firing. I make the mistake of looking back at the people in line about then, and they looked like they were ready to kill also, and I was one of their targets. I stood there at the register and stared daggers at the old man and the two clerks trying to help him. I think they felt my heated gaze, because after another eon or so, one of the clerks managed to break away from the parlay and come help me. It wasn’t my guy. He stayed with the old man. It was the other guy who had originally been on the other register. Of course, he didn’t know my situation, so I had to explain the whole thing to him, give him my info, including my ancient date of birth, all over again. Let me go look for it, he said, assuming I and the other clerk were both idiots. I thought he was only half right. He came back after a while and said he couldn’t find it. The people still in line were setting up tents. Let me go look on the computer, he said and left again. He came back about a year later and told me triumphantly that he had found my order, but for some reason it was in some kind of limbo status. It had been placed on hold, he said. But we can fill it. It should be ready in about 45 minutes. I gave up and left Walmart, and the distant memory of fresh air and sunshine as I walked to my car calmed me some, enough that I decided not to get the revolver out of my trunk and go back into the store. Instead, I got in my car and drove away, upset that the whole blasted fiasco was going to make me late for my anger management therapy. On the square in Bentonville, Arkansas. Yes, I know it’s the 21st century, but here in Arkansas we run about 100 years behind the times in many ways. But that could be changing. Voters in two counties of Northwest Arkansas will be voting in November to legalize liquor sales. Currently, Arkansas has a mix of dry and wet counties. Also on the November ballot is a proposal to make medical marijuana legal in Arkansas. Seventeen states now have medical marijuana in some form, but none of them are in the South. It appears Arkansas will be the first southern state to have the issue put before the voters. Benton County, in the northwest corner of the state, is the fastest growing county in the state, booming from being the corporate headquarters of Walmart. If you’ve never heard of Bentonville, Arkansas, it’s just a matter of time until you do. 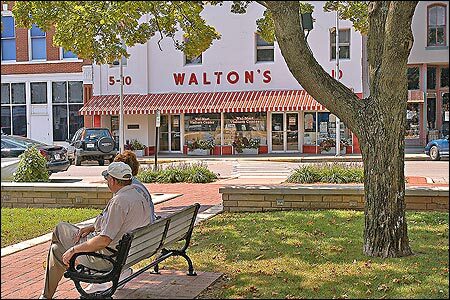 When Walmart was founded in 1962, the county seat was a quiet little burg of 3,500 people. Fifty years later, with the explosive growth of Walmart, it has ten times as many people and the four counties in the northwest corner of Arkansas are now ranked as the 109th most populous area in the country with a population or more than 400,000. Interestingly, two of the grandsons of Walmart founder Sam Walton have poured hundreds of thousands of dollars into the petition effort to get the booze question on the November ballot. It’s hard to believe Sam would approve. He never allowed the sale of alcohol in any Walmart stores during his life, and it’s only been within the past couple of years that Walmart finally started selling wine and beer. Benton County borders Missouri to the north. Just over the state line, there are huge liquor stores and a constant parade of Arkies buying liquor and heading back to Arkansas. Though it is illegal to do this, there is no law enforcement effort to stop the flow of alcohol into Arkansas. And the losses in tax dollars to Arkansas are in the millions. Legal booze in the boonies? Perhaps even more indicative of the changing times in Arkansas is the fact that in Madison County, which lies southeast of Benton County, the liquor question will also be put to voters in November. What makes this significant is that Madison County is almost the direct opposite of Benton County. Madison County is intensely rural. The county seat of Huntsville, the largest town in the county, had a population of just over 2,000 in 2010. Imagine, if you can, an entire county with not one stoplight. That’s Madison County. The effort to get medical marijuana put to a vote statewide has been a struggle for advocates of the measure. They tried to get it on the ballot four years ago, but failed to get the more than 60,000 signatures needed from registered voters. This time, the measure was certified for election, but now an opposition group is challenging the proposal in court and trying to get it off the ballot. But it’s doubtful the opposition group, which claims to represent “Arkansas values,” will be able to stop the medical marijuana vote. Voters will probably vote it down this November, but just getting it on the ballot is an eyebrow-raiser. Of course, the real truth is that booze and pot are readily available everywhere in Arkansas, one way or another. But making it legal to do what people are doing in huge numbers illegally will at least get some power out of the hands of people who are still living the 19th century. Have you ever seen a Walmart checker sitting down? Bet you haven’t, unless she was on a break or lunch hour. Same goes for Target, K-Mart, supermarkets, convenience stores and all the retail outlets out there. Why don’t these employers allow checkers to sit? Do they think their brains are in their asses? That’s where the brains of the people who run those places must be. The human spine isn’t meant to stand on a hard surface all day long. Some of these checkers are older than dirt and their backbones must already be in bad shape. A long time ago, my wife Ann worked as a checker at Handy Dan. 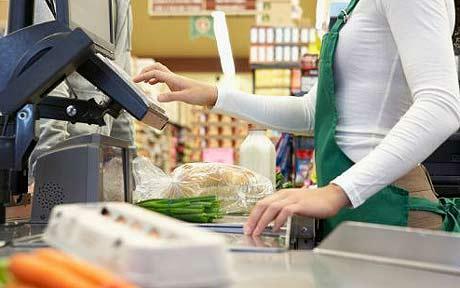 She discovered that all the check-out stations had a built in seat for the checker that you could slide out. She and the other checkers decided to start using them. Just a few days later, she came to work to find management had removed all the seats. I think retail management is mean -spirited. If they want to prove me wrong, let the people sit. They’ll be fresher, cheerful, happy and grateful, and it would show a measure of mercy and thoughtfulness that is rare in retail. Stand up for your employees. Let them sit. When you shop at Walmart, you get frustrated because the check-out lines are so long. When you get frustrated, you challenge a redneck for having too many items in the express line. When you challenge a redneck, he takes you out back and beats the crap out of you. When you get the crap beaten out of you, an ambulance takes you to the hospital. Whey you go to the hospital, you run up huge medical bills. When you run up huge medical bills, you take bankruptcy. When you take bankruptcy, your wife kicks you out. 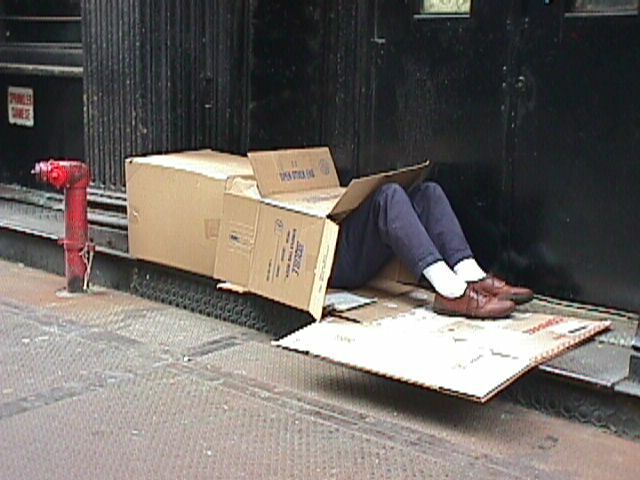 When your wife kicks you out, you live in a cardboard box. Don’t live in a cardboard box. Don’t shop at Walmart.